Family ministries are those that center around the family and individuals to come alongside them in spiritual growth and education.These ministries include: Christian Education ministry, couples ministry, men’s, women’s, 4:12 Youth ministry, Mighty Men of Valor, pre-marital counseling, senior adult ministry, and more. Sunday School ministry that includes Nursery, Early Childhood (Pre-K & K), Children’s (Grades 1-6), youth (high school), adult classes, and Chosen Vessels Ministry to teenage girls. Ministry to the couples of the church through small group venues, activities and fellowship. Small group ministry for men who struggle with various forms of sexual addition to break addictive patterns and develop integrity. Small group ministry to women struggling with relational problems, addictions, codependency, father wounds, and shame. A gathering and time of fellowship for the men of The House of the Lord® and the community of men at large. Includes Tuesday night Men’s Fellowship and Rites of Passage for young men. The School of the Prophets is the ministry that trains those with a prophetic gifting in exhortation, comfortation and edification for the Body. Ministry of support and discipling of engaged or newly married couples. Ministry to the senior adults of the community in terms of programming, events and the coordination of care. Tiger Cub through Boy Scout troops for boys. 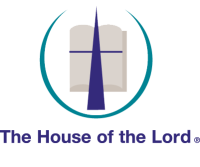 The House of the Lord 4:12 youth ministry, derived from I Timothy 4:12, is a place where our students, and families are loved, encouraged, and strengthened as they grow in their faith. Our youth and youth ministry serves youth grades 7th through freshmen year of college. Our primary goal is to help youth develop a personal relationship with Jesus Christ by providing them the resources to grow in worship, ground them in the Word, and give them opportunities to witness and serve others. We also give them the skills and support they need to make wise decisions at this critical time in their lives.